We’re a group of online crafty friends who love being creative. 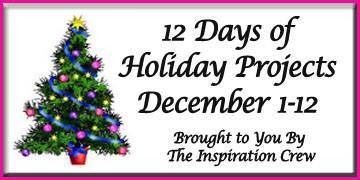 We're now on Day 5 of a 12 day event to provide you with tons of Holiday-themed inspiration. We're making crafty projects using products we like and some of us are even offering prizes! Check each blog for information about what prizes are being offered and when the winners will be announced on that blog. This card is a CASE of this card by Deanna Jean here. As you probably guessed, this one was made (24 times!) as part of my Church Christmas project, for my mom's church, to help support her handbell choir. The bough is from Old Island Stamp Company, the dies for the bow and the bells are from Papertrey. I added some dimension to the bow with a red Copic marker - next time I'll choose a slightly darker shade! And the sentiment is from Hero Arts. Beautiful card! Love those shiny gold bells! The card is truly gorgeous! I really like it!! Pretty and classy - love the pine boughs and the bells. How perfect in every way! Love this, Ardyth! This is stunning, Ardyth!! Love, love, love every detail! Gorgeous card, Ardyth! I love that bough stamp. wow totally gorgeous.. love those gold bells..
Gorgeous golden bells; I'm sure they flew off the table at your mom's craft sale. thank you so much for your comments on my FF entries; sparkle added to my day! Gorgeous! I love the gold bells! So you found a bell to use for the bell choir. They look wonderful with the stamped branch. ...ring-a-ling...Bev cracked me up with her comment! Another stunning card! 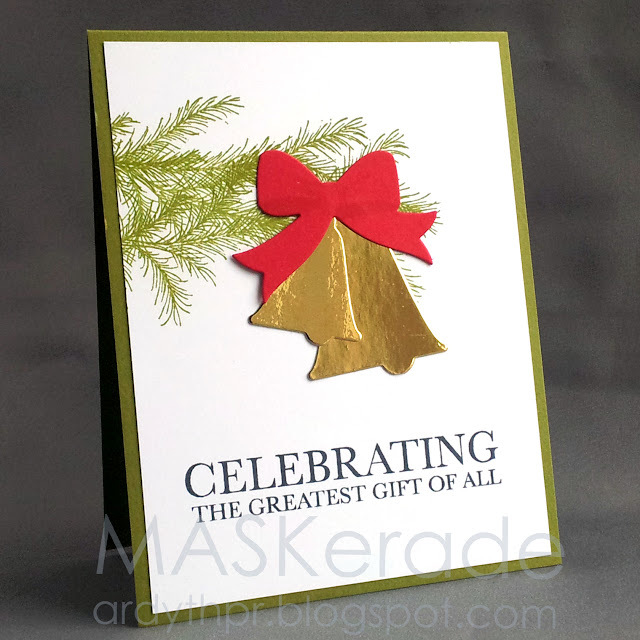 I love the pretty pine bough - it sure looks great with the red bow (BTW, I can see some shading in the bow). 24. Do you get to enjoy Advent at all? That bough is absolutely gorgeous. And perfectly stamped. 24 times I'm sure. You can probably tell that I am going through these posts backwards. Another stunning set of bells. I love the gold, green and red.